PowerSpins Launches the "Christmas SpinFest"
This Christmas season, PowerSpins Casino lets you enjoy FREE Spins every week. Try your luck and win HUNDREDS of Free Spins! As Christmas approaches, PowerSpins Casino is giving away tons of prizes to all those who believe in a bit of luck! PowerSpins is giving away more than 6,500 FREE Spins! Hurry up and grab as many as you can! If you want to fill your pockets this holiday season, then you should not miss this chance to win Free Spins, every week, at PowerSpins. 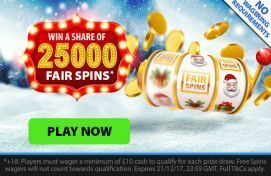 Have a look at this charming Christmas PowerSpins’ bonus! What should you know about this bonus offer? You must collect ticket entries to participate in the prize draw! PowerSpins gives you 1 ticket for every £10 you wager, making it extremely easy to collect a ton of tickets, especially if you’re a regular player at this online casino! When you wager on the week’s featured game, you get not 1, but 2 tickets for every £10 wagered! So, find the Power game of the Week and get loads of tickets! You may only use the Bonus Spins only on the games featured on the table. How will the Free Spins from the prize pool be distributed? During each prize draw, 15 lucky players will be selected. The bonus will then be distributed according to their rank. For example, if you win first place, you might get 300 Free Spins, if you win second place, you can get 250 Free Spins, and so on. PowerSpins Casino is definitely going on the nice list this year for giving away unlimited tickets! All the games count, wager all you want! Hey winners! Be sure to use your Bonus Spins before they expire in 3 days. Bonus info: terms and conditions apply to the offer. If something isn't clear, have a look at our review of PowerSpins for the T&Cs in full. The offer on this article might have expired by the time you read it. Please refer to the review pages for the latest bonuses and promotions available. BGO Casino Is Giving Away 25,000 Fair Spins! Snap a €200 Bonus to Play at EnergyCasino - TODAY! 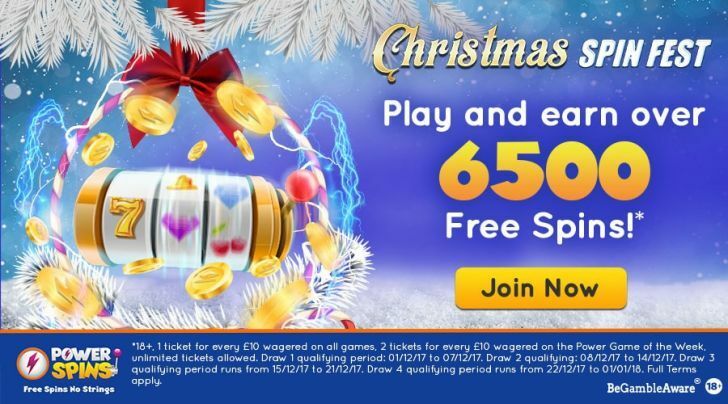 Get Your Festive Bonus and Free Spins at TonyBet UK!